CD review: "In the Shadow of the City"
By all accounts, Maurice John Vaughn is one of the nicest folks in the blues world and is also one of the most gifted. He has a smooth voice coupled with a biting sound on guitar, both of which are augmented by his outstanding compositional skills. He also plays saxophone, although he doesn't really play it as much as guitar, or feature it so prominently. 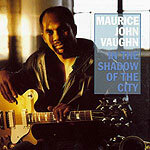 This is Vaughn's first release in five years; 1988's "Generic Blues" garnered Vaughn both critical acclaim and valuable airplay. "In the Shadow of the City" should do even more. Vaughn's blues is contemporary, uptempo, rock-influenced and crisp  much like that of others of his generation, such as Joe Louis Walker or Kenny Neal, but with a dash of Parliament or the Ohio Players thrown in, giving it a definite funk feel. He also incorporates elements of jazz, especially in his guitar lines that just stick in your head. Vaughn doesn't play all that fast, but he has such excellent taste and a fertile imagination that each solo and fill resounds with character. The best song here (all but two are originals) may be "Suicide Is Not the Way," a mid-tempo funk/shuffle with a life-affirming message. The moving lyrics are laid down over a hook-filled melody and a syncopated beat very good effect. This is a listenable CD that has a way of sticking in the stereo instead of being filed away.